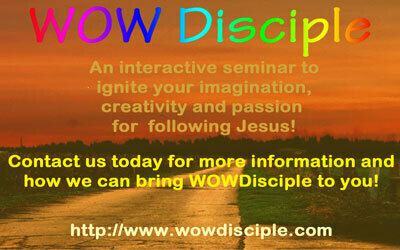 Partakers WOWDisciple - an interactive seminar designed to ignite your imagination, creativity and passion for God! We would love to bring this to your church or christian group! Play the video excerpt to find out more. To find out even more, including excerpts of seminars held please click here to visit the WOWDisciple website. Here is one comment sent to us recently! "" Comment below or email us at info@wowdisciple.com and we will send you details or talk about how we can help you... 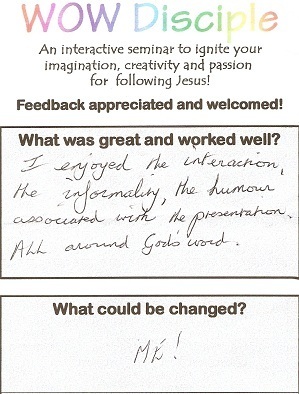 The image below also gives an idea of the feedback we have received from that day! 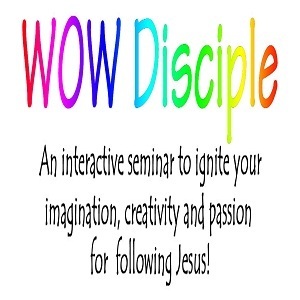 Partakers WOWDisciple - an interactive seminar designed to ignite your imagination, creativity and passion for God! This is an video excerpt from a recent morning, and it is the teaching session on Sin. The image below also gives an idea of the feedback we have received from that day! This is an video excerpt from a recent morning. We would love to bring this to you! Comment below or email us at info (at) wowdisciple.com and we will send you details or talk about how we can help you... The image below also gives an idea of the feedback we have received from that day! If you need more information, or are thinking of coming, please do make contact! It would be great to see you there! Come for just one session or stay for all 6! New believer? Come and learn! Mature believer? Come and share your experiences! What is a human, and what do humans consist of? The atheistic and naturalistic theory denies the existence of a spiritual world and claims that our thoughts and feelings, love, fear, hatred and guilt are physical or chemical in origin. However, the Bible indicates that humans are composed of 3 parts - Body, Soul and Spirit. The spirit and soul are only separable in thought and are probably best seen as two separate dimensions of the non-material side of a person - the spirit relating to God, and the soul relating to earth. All three parts, spirit, soul and body have an important role to play in our human-ness. The spirit is our spiritual system, which is seen in our consciousness of God and in our faith and conscience. The soul is our psychological system, and is observed in our use of mind, emotions and will. The body is our physiological system, and is seen in the five senses - Sight, Sound, Taste, Touch, Smell. It is important to note that the whole person is valuable to God, not just the spirit as Paul explains the Bible verse I read earlier. Other philosophies and religions have tried to portray the body as evil or irrelevant, and this has crept into some parts of Christianity, with the tradition of priestly celibacy and asceticism. A break down in any of these areas can cause imbalance in the other areas. For example, research has shown that, sometimes, physical sickness can be caused through emotional turmoil. Studies have also revealed that mental illness may occasionally be caused through guilt or unforgiveness. Underlying all this, mankind has an inherently sinful nature. A nature, being as it is in conflict with God, that is self-centred and self-pleasing rather than a nature that is God pleasing and God centred. The resulting violation of God's spiritual order leads to many conflicts and imbalances. A prime example of this is observed when we have fits of rage, self-pity or worry. For more to think about please read Psalm 139. Ask yourself the following questions, writing them down if you can, and see how you respond or react to them. Then why not share your answers with your spouse or a close friend, so that you can pray over any issues together. Q1. How do the three parts, body, soul and spirit, interact with each other? Q2. Why is the whole person important to God? Q3. What is it about me that makes me, human?